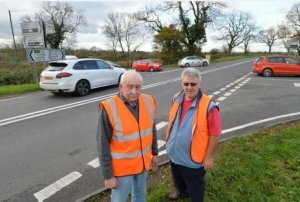 Cllrs Durran and Reynolds pose for the press as part of the campaign for safety at Shearsby Crossroads. Harborough FM Facebook page. Comments and reports of yet more accidents. Log into Facebook and then click this link. Press report from the Leicester Mercury dated 5th May 2018. Press report from the Leicester Mercury dated 26th July 2017. Press report from the Leicester Mercury dated 31st March 2017.